Skolkovo resident company Group-IB won a cybersecurity award in the Runet awards last week, which are awarded for excellence in the development of the Russian internet sector. 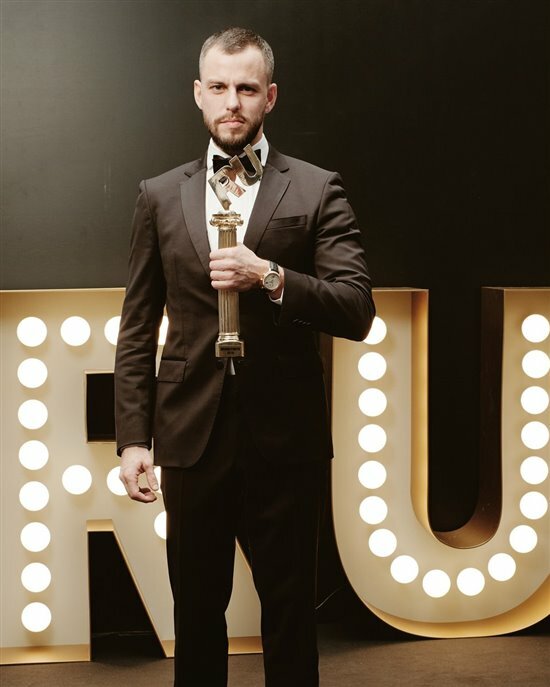 Group-IB CEO Ilya Sachkov with his company's award at the Runet awards on November 29. Photo: http://kto-chto-gde.ru/premiaruneta/. The award was collected by Ilya Sachkov, CEO and founder of Group-IB, in an awards ceremony on November 29 in the Cosmonautics and Aviation centre at Moscow’s VDNKh complex. “In the cybersecurity nominations, we would like to note several breakthrough projects by Group-IB to protect users of online banking,” the Runet awards’ organisers said on their website. “In September 2018, Secure Bank Mobile SDK was launched: smart protection for mobile banking apps and banking payments on mobile devices, which makes it possible to prevent attempts to commit fraud, detect attacks on users of electronic banking systems, and efficiently enhance existing anti-fraud systems in banks. Secure Bank Mobile SDK complements the Secure Bank flagman product, which is already protecting tens of millions of users of Sberbank Online and Sberbank Business Online, including both individuals and businesses,” the description of Group-IB’s nomination reads. The Runet awards organisers praised Group-IB for its Secure Bank product, which was developed with the help of a grant from the Skolkovo Foundation. Secure Bank was developed with the help of a grant from the Skolkovo Foundation. The module, which was launched for international markets in September, can detect fraudsters by analysing factors such as the user’s mouse movements, speed of use and keystroke dynamics to establish whether it is a legitimate user or fraudster who is logged in. The Runet awards also praise Group-IB’s work to protect .ru domain names and the Cyrillic equivalent, .рф. “For a long time, all of global cybercrime was actively registering domain names in Russia, and creating phishing sites en masse that would send out viruses or were controlling botnets. In the last seven years, specialists from Group-IB’s CERT (Computer Emergency Response Team) have blocked about 12,000 ‘.рф’ and ‘.ru’ domain names, primarily those that were controlling botnets, distributing malicious programmes and phishing,” the Runet experts said. Group-IB and Sachkov, who moderated the opening session of the Skolkovo CyberDay event on Friday, have won numerous awards. Sachkov has won the EY Entrepreneur of the Year award three times, and in January 2016, he was included in the Forbes list of 30 Under 30 in Enterprise Tech. Group-IB investigates about 80 percent of high-profile cybercrimes in Russia and the CIS, and has developed advanced threat intelligence systems to analyse a company’s weak spots and predict what form an attack might take, thereby helping to prevent them. The Runet awards have been held every year since 2004. Other categories at this year’s awards included education, mobile apps, Facebook groups and the internet for children.